The Suzuki Jimny is cute but the Suzuki Jimny monster truck is, well, a monster! Think of the Suzuki Jimny and the adjectives that come to your mind are cute, sweet, pint-sized and the likes! 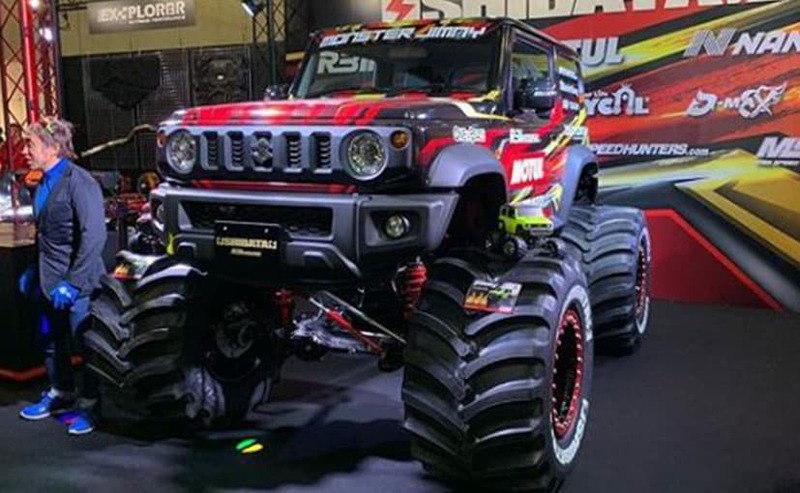 But, at the 2019 Tokyo Auto Salon, there was Jimny which was anything but the adjectives mentioned above! It was a wild, huge Suzuki Jimny in a monster truck avatar. It almost felt as if the regular Jimny was hit a solid blast of Gamma radiation and turned into the Hulk! Actually, the twisted brain behind this model was that of the Japanese tuner Shibata R31 House. 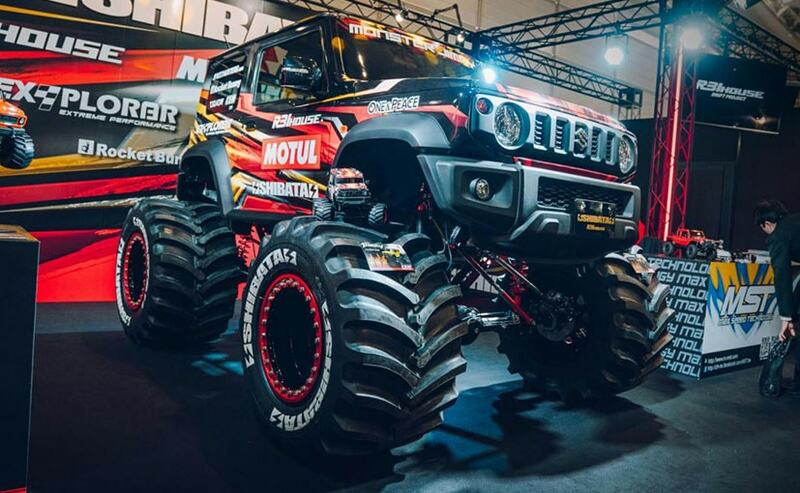 The Suzuki Jimny monster truck actually looks like a giant remote-controlled toy. Not surprisingly, the folks at Shibata R31 House had actually showcased a remote-controlled version of the Jimny monster truck. Suzuki Jimny toys are quite popular in Japan. Shibata R31 usually does custom jobs on Nissan R31 Skyline platform but this time they thought of something different. And we are glad they did! The Jimny monster truck gets huge, 42-inch super-sized tyres with beadlock wheels and a mental hard-core suspension setup along with a flashy colour scheme. The Suzuki Jimny monster truck sure gives tough competition to all those souped up AMG G-wagons and Range Rovers. The standard Jimny itself is no pushover either! Despite its compact proportions, the 2019 Jimny has proven to be a capable machine on and off the road. The standard Jimny gets two engine options. These are the 658 cc, 3-cylinder, petrol engine that offers a maximum of 64 bhp and develops a peak torque of 96 Nm. The Jimny Sierra features a 1.5-litre K15B, four-cylinder, petrol engine churning out 100 bhp of max power and 130 Nm of peak torque. And of course, you get shift-on-the-fly 4x4 and a 5-speed manual gearbox. The 4x4 also gets low range transfer gears.